The anti-corrosion structure of the FRP Pipe manufacturer consists of four layers. 1. The inner surface layer (also known as the inner lining anti-corrosion layer) functions to resist medium corrosion. It is a major component of the corrosion protection structure. There are two methods for manufacturing the corrosion-resistant inner liner. First, the glass-fiber surface felt, organic fiber surface felt or other reinforcing material rich resin layer, the required glue content is about 90%, the thickness is 0.25-0.5mm. Second, FRP Pipe manufacturers use thermoplastics such as polychlorinated Lining material such as ethylene or rubber. 2. The secondary surface layer (also called the anti-seepage layer) has a lower gel content than the inner surface layer, and about 70%-80% is usually paved with chopped strand mat made of chopped fibers; its soil function is to prevent medium leakage. The secondary skin layer usually contains at least 1200 g/m2 of chopped strand mat. 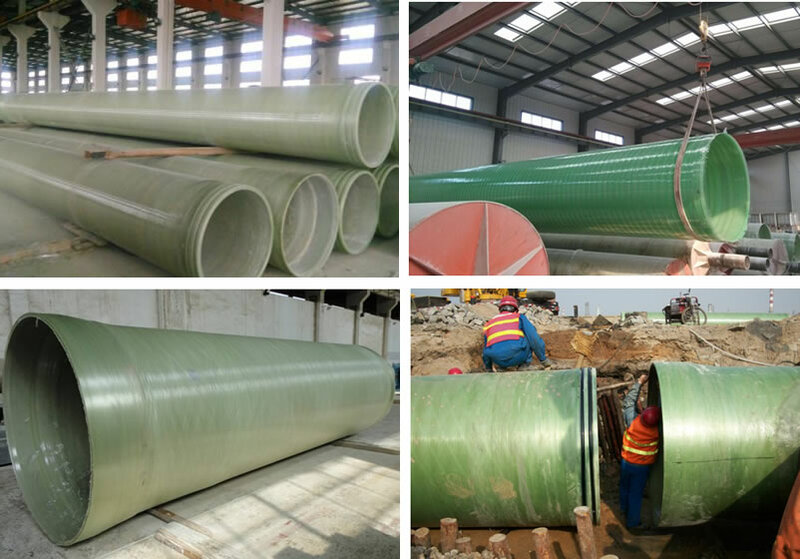 The inner and secondary agricultural layers of the GRP Pipe shall be made of a combination of inner and outer skins of a corrosion-resistant resin with good toughness and high impact strength. The content should be (27 soil 5)%, and the combined thickness is not less than 2.5 mm. 3, FRP Pipe structural layer (also known as strength layer) This layer is the main structure of the tank wall, used to withstand external loads, by continuous fiber winding or by hand-forming of fiber fabric, the amount of glue is 35%-55 %. The structural design of the FRP Pipe manufacturer is primarily to determine the layup and thickness of this layer. 4, the outer layer (also known as anti-aging layer, some require flame retardant) it is the outer protective layer of the tank structure layer. The function of the GRP Pipe is to protect the structural layer from external mechanical damage and aging caused by external environmental conditions. It is also a decoration for the outer surface of the tank. This layer contains about 60%-70% of the glue. The outer layer can also be repaired with resin putty and painted. This layer is not required for indoor use equipment.